Yet another LE review! You can view my service/brow theory review and lip product review too. 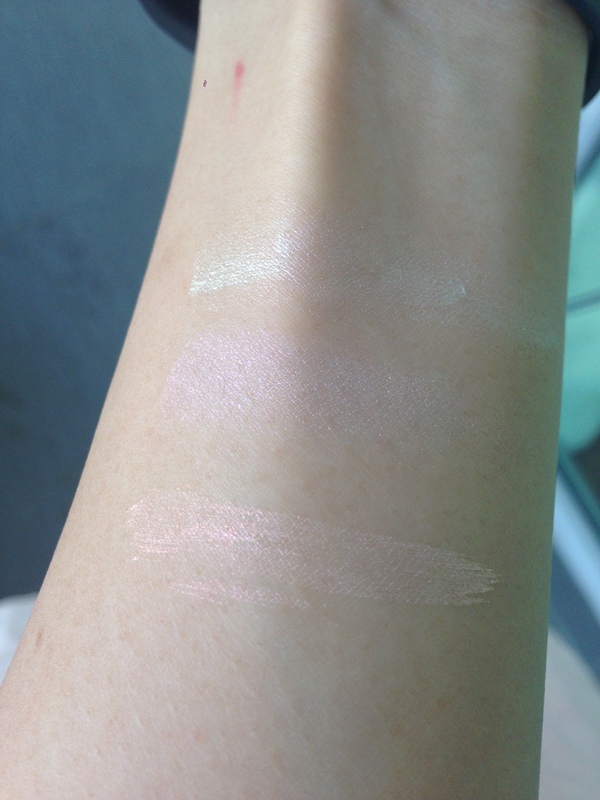 I got 2 sample of illuminators, Celestial and Nebula. 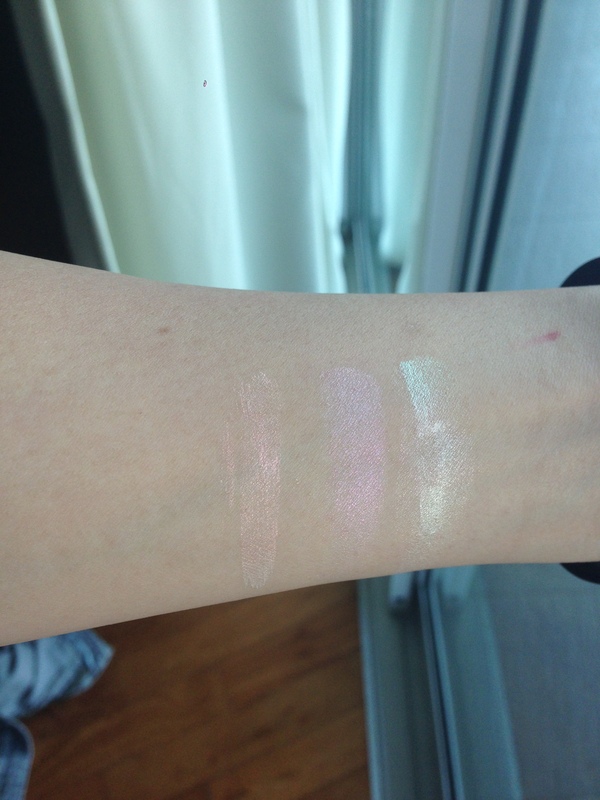 LE makes quite a few shades of highlighters, and Celestial and Nebula are the fancy duochrome K-Pop-SFX ones. The rest are straight colours. While pretty, I already have a golden highlighter and a pink-champagne, so I only go for all teh special effectz now. The full size is $12 for normal ones, and $14 for the special effect ones. It sounds just a little bit pricey, especially for indie products. The quantity of product is also not stated. The samples are a very wallet friendly $1.50/$2, and come with enough for many, many uses. 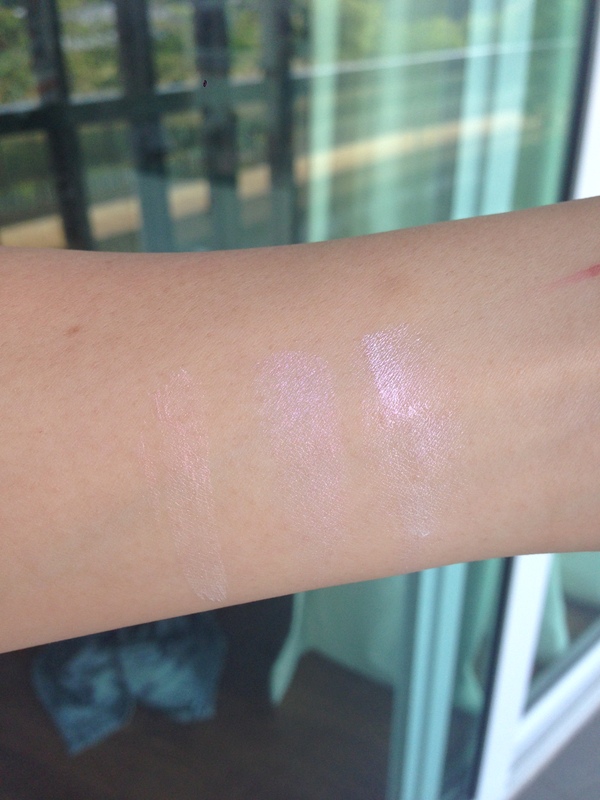 All swatches are: L-R Celestial, Colourpop Monster, Nebula. Nebula appears green/pink, while Celestial is rosegold/pink. I can still never remember which is which unless I look it up. I swatched them against Monster because I thought they would be a dupe, and I much rather support LE anyday over Colourpop. 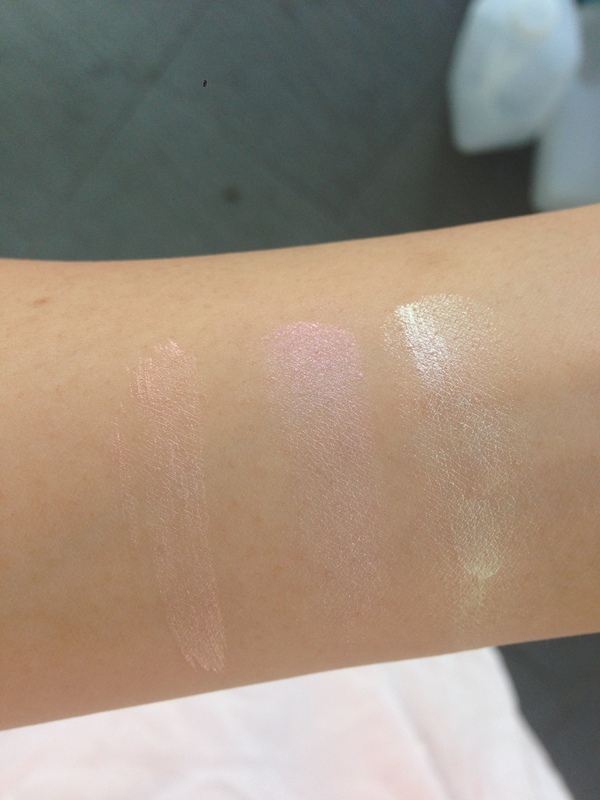 Turns out they are not dupes, but LE’s highlighters have even more shift than CP’s. MOAR SFX ROAR! LE’s highlighters are like a lotion, or very light cream consistency, which make it hard to swatch, and also sheerer, but easy to pat on the face with a brush or finger. They sheer out and build up easily as well. It’s not the easiest formula to use (liquids are always the hardest!) but the formula is solid. Celestial on my face. (GAWD or is it Nebula. I think it’s Celestial.) I find that it emphasizes pores just a little bit. It’s nice and glowy and not at all glittery, just with a very nice sheen. It also lasts pretty well, but then it’s a very obvious colour/highlight, so I’m not sure if it’s just more obvious to my eyes. I sweated and stuff, and it was still there. Overall I’m very happy with the 2 highlighters. Highlighters are next to impossible to use up, though, so I don’t foresee myself going for a full size even though I love them. I would recommend you to grab a sample of a colour you like! The BEST budget brush EVAR!